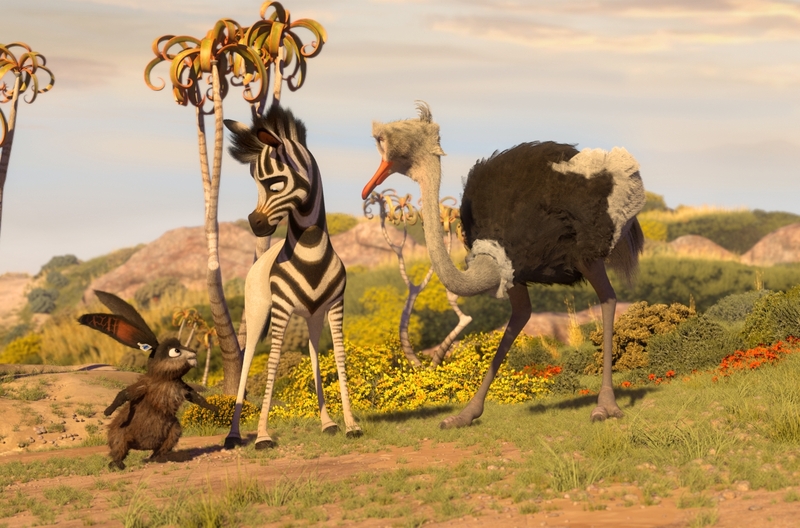 When young zebra Khumba (voiced by Jake T. Austin) is born with only half of his usual stripes, his superstitious herd believe it to be a bad omen and he is quickly blamed and branded an outcast when a drought falls upon the dazzle’s land. Years later, Khumba’s poorly mother, Nora (Catherine Tate), tells him a story about a ‘magic waterhole’ where zebras supposedly get their stripes. Naively misinterpreting the tale to be real, he sets out on an adventure to find the mystical fountain, joined on his journey by lively wildebeest Mama V (Loretta Devine) and ostrich Bradley (Richard E. Grant). As the eclectic trio continue their search they are hunted by Phango (Liam Neeson), a blind leopard who believes Khumba to be the fulfilment of a prophecy. For all the problems Khumba has, one can’t fault the animation. South Africa’s Great Karoo is nicely rendered throughout, but it’s the narrative that takes place within the world that disappoints. The message of self-acceptance is a favourite of animated cinema, but rarely has it felt so formulaic. Written by Silverston and Raffaella Delle Donne, the script plays like an uncomfortable mash-up of The Lion King, Madagascar, and Ice Age far too often. Additionally, the through-line of the film is made very clear before Khumba sets out on his quest, and the manner in which his journey begins is so contrived that we’re not really invested in it. It’s not exciting, it’s not particularly funny, and it’s extremely predictable. Elsewhere, the voicework ranges from solid to bland. Neeson is the one who comes away looking the best as the menacing Phango, whilst Laurence Fishburne delivers the vast majority of his dialogue in a boring, monotone voice as Khumba’s characterless father, Seko. Austin’s kid-friendly dialect is well-suited to our hero, while Grant and Buscemi will doubtless amuse younger audiences in fits and spurts. Kids may find some enjoyment in Khumba, but the messages it preaches have been told far better in many an animated film before it. In other words, watch The Lion King instead. This review was originally published at CineVue. This entry was posted on April 10, 2014 by Amonymous. It was filed under Film Reviews and was tagged with Anthony Silverston, Jake T. Austin, Khumba, Khumba: A Zebra's Tale, Laurence Fishburne, Liam Neeson, Loretta Devine, Raffaella Delle Donne, Richard E. Grant, Steve Buscemi, Triggerfish Animation Studios.